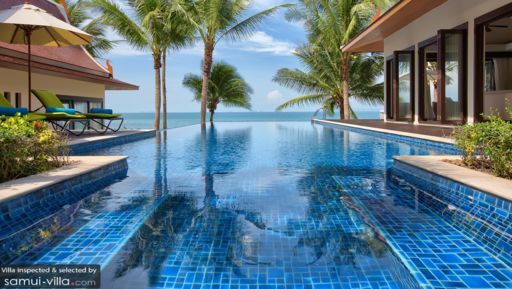 Located on a stretch of white sandy shores, Baan Chang is a luxurious villa part of the exclusive Dhevatara Cove on Taling Ngam Beach, Koh Samui. 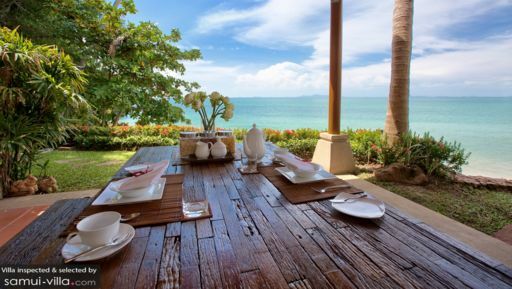 Peaked Thai ceilings and rooftops, stone-sculpted elephants in the gardens, access to the beach, and an abundantly rich natural landscape make this villa special and a better choice as a holiday spot! With five bedrooms and expansive gardens, this is a perfect place where you can hold private events and enjoy a party with loved ones. The living, dining, and bedrooms are housed in distinct pavilions, located around the swimming pool, garden, or upstairs overlooking the gorgeous ocean. Baan Chang has five bedrooms scattered all around the property, some housed in individual pavilions and one of them upstairs with its own balcony! The master bedroom has its own beachfront pavilion for endless vistas and is furnished with a king bed. The upstairs bedroom has spectacular ocean views as well, while two of the bedrooms are located close to the entrance near the gardens. The last bedroom is located poolside with easy access. Each bedroom is fully-furnished with lounge chairs, ottomans, and televisions. With en-suite bathrooms fitted with bathtubs, the bedrooms are complete as luxurious private havens for guests. Nestled in a cove, verdant gardens of Baan Chang greet you upon arrival where you can bask in the delicious natural surroundings flush with tropical plants and trees. The fragrant ambiance is made all the better due to infinite ocean views to be enjoyed from the swimming pool. Flanked by a pool deck, the pool is an ideal spot to spend your morning or afternoons, just taking in the breathtaking view. Lounge on the numerous sunbeds and enjoy chilled drinks, a good book, and the hot tropical sun! Relax on the beach chairs found on the sandy shores for the perfect way to unwind. The living and dining area have been housed in distinct pavilions that are open-plan to allow for easy movement as well as constant views of the scenic landscape. The living room is furnished with a cosy seating corner under a peaked ceiling, decorated with Thai artefacts and things, and a wall panel with a TV, DVD player, fax machine etc. The carpeted floors create a luxe vibe in the room and since you can keep the doors open to the pool, this space is perfect for entertaining guests well into the night! As the villa promotes living as one with nature, the open-sided pavilions are ideally suited to these needs as you can not only enjoy the peace that surrounds this region of Samui, but also appreciate the meditative quality of just staring out at the calm waters of the ocean, pool, or the green gardens! You can do this even while you’re dining on the round table, which can accommodate plenty of people. The modern kitchen with a breakfast bar is at your disposal, and it is fully-equipped with amenities and appliances. The villa is part of a private estate hence, guests have the advantage of using the common facilities like the gym, sauna, etc. The villa itself is fully-staffed with housekeepers, security, and gardener to keep everything in check. With personal guest assistance, you have your needs taken care of. Guests can request for car rentals, massages, and a personal chef, if they so wish! Found on an idyllic beach, the villa is meant for those who want some quiet time without anything to deter their peace. The calm waters and island breeze is there to lift your spirits, and Taling Ngam beach is the place for it. You can view the Ang Thong Marine National Park from here and even interact with the local fisherman. Further away is Lipa Noi beach and the Nikki beach club, if you wish to explore the area a bit more! The place is located about 10 minutes from Ao Nang. In the price you have your own driver included so it is not an issue. You are given a mobile so you can phone the driver and let him know you would like to be taken somewhere/picked up. The place is clean and spacious. It has a good size swimming pool and chill out area. The place is quite and good if you are looking for privacy. I would recommend it to anyone traveling with larger group or family. I was been amazed that such a good villa to stay in krabi, the staff was nice and cheerful, the environment was cozy and beautiful especially the private swimming pool. Location wise is quite and silense which I prefer to stay in during my holiday. 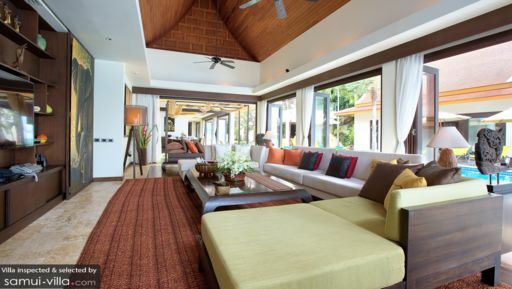 We booked Baan Chang and Baan Gecko for our Jan 2013 stay for a group of 10 over people. The place is huge, clean and beautiful. Fully equipped. Fast check in and check out. We have no problem finding the villa with our rental vehicle with GPS. Will definitely recommend to friends who would be travelling to Krabi. The service from Ching and Gree was exceptional and we wish our thanks to be forwarded to both. The maid service was so discreet that even whilst we were in the villa we barely knew they were there. The villa itself was beautifully decorated and light and the cleanliness was second to none. The location was stunning and thanks to the complimentery transport service most amenities were quickly accesssible. The only tiny issue in our whole stay was a toilet with a bit of a lame flush but quickly attended to once Ching had been telephoned. The resort is very clean and with daily maid cleaning services with ample towels provided - we brought them along for our island tours and also the hot springs adventure. The company was very helpful in assisting all our needs and they were very prompt and efficient to meet all our needs. The tuk tuk service was very reliable and the driver was very patient with all our requests. We were also relieved of the hassle of booking for the tours as they had provided us with all the brochures and very kindly also assisted with the lunch arrangements during our island hopping. They arranged for in-house massage services and we had also engaged their in-house chef who prepared an excellent meal for the 9 of us! We had a fantastic time in the Villa and we didn't have the heart to leave Baan Chang! Thank you Ching and JJ for the wonderful memories!